To celebrate the fabulous Ben & Jerry’s ice cream company turning 35 this year they decided to hold a Moosical in London! 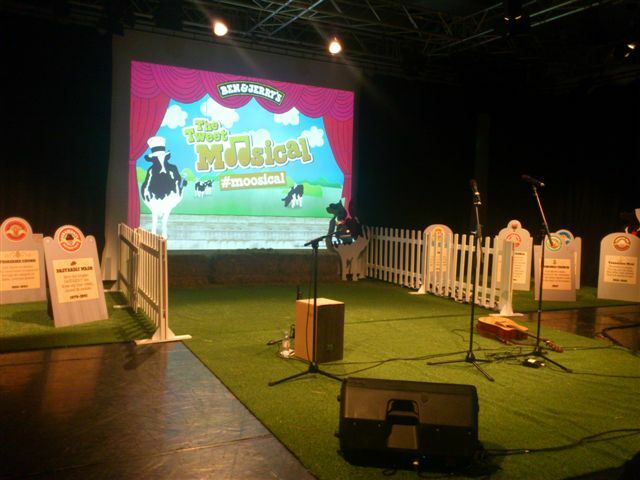 The premise was simple, audience members were asked to tweet in puns (cow, dairy or ice cream inspired) of musicals or recording artists. These would then be improvised into the show to the hilarity of all. The artist in charge of our amusement was the severely talented Abandoman, winner of many comedy awards. How one man’s brain can work so quickly to bend a song or rap on the spot amazes me. In fact it’s impossible to describe, so I recorded a couple of videos to show you all. In this next video the audience were asked to shout out fun activities for a cows day out. Those people with funny suggestions (like zorbing) were then pulled on stage and dressed as cows to dance along. Finally the night ended with a song about an after show party. One member of the audience had particularly inspired Abandoman with on the spot renditions of Cher songs, so we were all invited (jokingly) to attend a party at his house (Rich’s House). This entry was posted in Out and about, Reviews and tagged ben, ben & jerry's, ben and jerrys, ice cream, jerry, moosical, musical. Bookmark the permalink.